Whatever the occasion, our confetti cannons instantly add a sense of celebration and amazes your guests! Our confetti cannons add that wow factor for any event! These cannons are made for professional use rather than the smaller ones you see from other shops! Our handheld confetti cannons are safe to use both indoors and out, and contain a large amount of confetti per cannon to maximise the effect! They’ll create a spectacular flutter of white and silver for that perfect twinkling effect at any party or Wedding. If you are interested in adding this to your package please get in touch today. The cannons are priced at £50 for 2. The confetti cannons themselves can either be set off by the Kent Discos team or by 2 party members of your choice. Instructions will be given/shown to the 2 party members if you choose to go for this option. 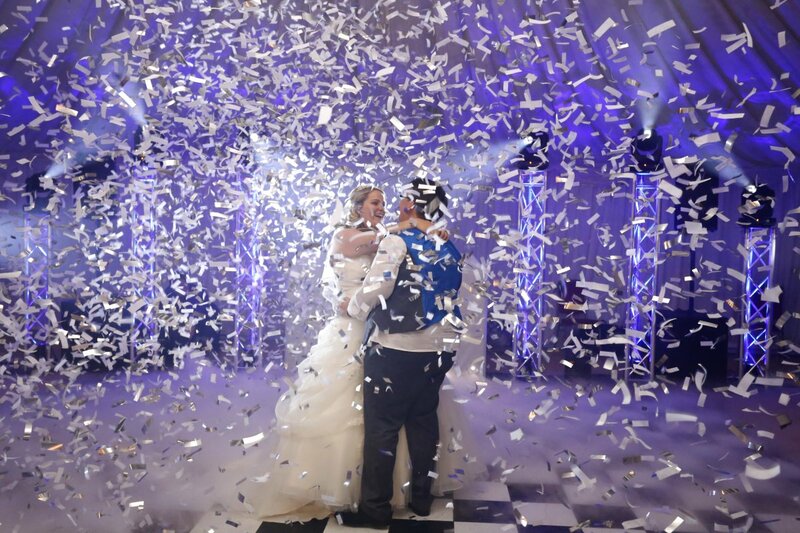 Take a look at the effect our confetti has when setting off during your first dance - a sure way to amaze your guests whilst you take to the floor for your first dance as a married couple.